Commission (and if you want a print keep in mind that you can see every single stroke at bigger prints since the commission was done for a small format ). ermahgawd i lurve this so much. It's so chubby and ADORABLE! Iv done myself a cat too....though havnt found a name for him/her! May I use this as a profile picture on a German community page? Amazing, great work! I like the Japanese sun in the background. 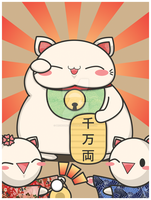 This is one of my favorite recent maneki neko Do you know what it says on the coin? It looks different from traditional. I know. This one says sho-huku = happiness. I found six different blessings (ken-ko, cho-ju, dai-kiti , kai-un, sho-huku or kin-un) and that one is what I like most. ^_^ Sho-huku is not as popular as the Ryo coin, but the more I crawl through info-pages the more coin blessings I find . Cool, I'll have to do some more research then. I'm making a 'maneki kitsune' and I'd rather have a more interesting phrase than the ryo coin on it. I'd only seen one other one so far but it didn't have a good reference pic and I don't know Japanese very well. 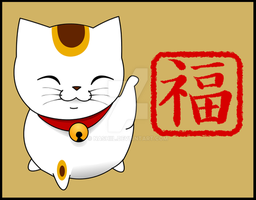 You can´t really combine Maneki + Kistune. If you mean you wanna make a kitsune figurine, it should be a Inari Kitsune. you really should do more research, it´s not that complicated even if you don´t speak fluent japanese. I assumed Maneki was the type of cat those lucky cat statues are. I know there aren't really kitsune of that type, I was just doing it for fun. He's pretending to be a maneki neko. Hi! I have just found your drawing, seeking for an illustration for my blog, and I have "stolen" it... It's really wonderful. Nice work !! you should have asked me BEFORE using it. Please remove it, i don´t want that. Holly cow what the heak did that person feed it to make it so BIG!!!!!! Howd you get the coloring to look like that???? it looks like an online drawn enhanced thing!!!!!!! in other words GREAT JOB!!!!! Huhu Neko ga BIG !